We like to think we know who is in charge. Sometimes we are right. Other time, probably not. As humans, I sometimes thing we like to take charge, rather than take responsibility. As Christians, I wonder about how we sometimes pray. 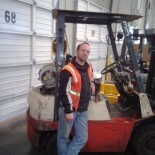 Sorry, not much in terms of forklift stuff in this one. In fact, I can’t promise much for the next few weeks. However, we will see if something does come up. Let’s start by presuming one simple truth. Christians should pray. I don’t think there are many who’d disagree with this premise. However, I would be the first to think that maybe we need to rethink why we pray. The sad truth is, I’ve been to many a prayer service in which all the prayers were related to material gain, and personal growth/popularity. Sadly, to attempt to question this somehow makes me anti-Christ. Since we are discussing the Small Catechism, let’s start looking at the Lord’s Prayer. Let’s ask this question: What would Jesus pray? Actually, that is pretty easy. We already know what he would pray. However, why don’t we look at in through the lens of the Small Catechism? Hmm.. last I looked, a father was an authority figure. He was the one who we had to respect, as he was the one who sets the rules. Interesting that Christ Jesus would have us refer to God as our father. In doing so, not only did he bring us closer to God, but he also made it perfectly clear who sets the rule and was the final authority. This really does put us in our place, as we don’t make the rules, God does. I won’t kid myself. In the working world, we all have somebody who is the authority. They are the one who sets the rules for the company, and we have to abide by them. In the same manner, and on a considerably higher level, God sets the rules for humanity, including those in positions of authority here on Earth. We all answer to him, for he is the final authority. He alone is the one we all must answer to on the last day. As we are just scratching the surface, and there is more to this, I am going to stop here for the time being. Yes, at this point, it may seem like this is all law, but I don’t intend to leave it there. Yes, God sets the rules, but that is why Christ came. May we consider that, and may we also consider that we are all under authority, even when we may be the ones in positions of authority. Indeed, as Christ Jesus told Pontius Pilate “you would have no authority if it were not given you from above”. Yes, I know, partial paraphrase, but there is a valid point. One we should all be mindful of. Here I stand. I can do no other. This entry was posted on 04/07/2016 by Christopher Rose in Law and Gospel, Other, Prayer and tagged authority, Christ Jesus, father, last day, Lord's Prayer, respect, Small Catechism.